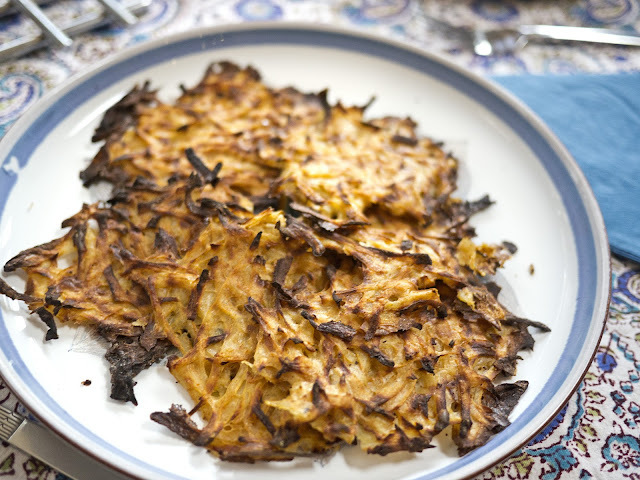 Nice and simple, I baked these potato pancakes in the oven rather than frying them in fat. Grate the potatoes and squeeze out as much water as you can. Mix with all the other ingredients and shape into pancakes on a large oven-proof baking tray, flattening them down slightly with the back of a spoon. Spray with Fry Light and bake for 15-20 minutes at 200°C or until golden and cooked through. Serve as an accompaniment or on its own with fromage frais (in place of soured cream).